Prime rib is considered one of the best cuts of beef for barbecuing. Tender and juicy, leaving the bone in helps the meat cook faster and ensures it does not dry out while cooking. Because of the amount of marbling and soft texture, grilling or searing the meat is optimal, rather than roasting. 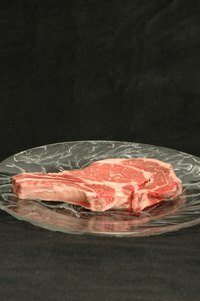 Although an expensive cut of meat, it is always worth it to choose a high-grade piece from which to cut your steaks. Ensure your rib roast is trimmed properly, with the thick layer of fat removed from around the ribs and the bones cut short enough to be manageable. Check that your rib roast is full, consisting of seven ribs. This will be the amount of steaks produced from the cut. Place the rib roast down on the cutting board so the bones are facing upwards; they will be your guide for where to cut. Begin your cut in the middle of the two bones closest to you. Cut straight down, stabilizing the cut of meat with your hand as it moves down the meat. Repeat this step with all the ribs. Measure out enough butcher's paper to cover each individual steak if you wish to keep the steaks for several days. Wrap all steaks separately in the paper and tie with the twine. Always choose the highest quality roast. Never salt your meat until after it is cooked. Salting the meat before it is cut will toughen it. A simple and easy step by step recipe for making a delicious and perfectly cooked ribeye roast, with photos.